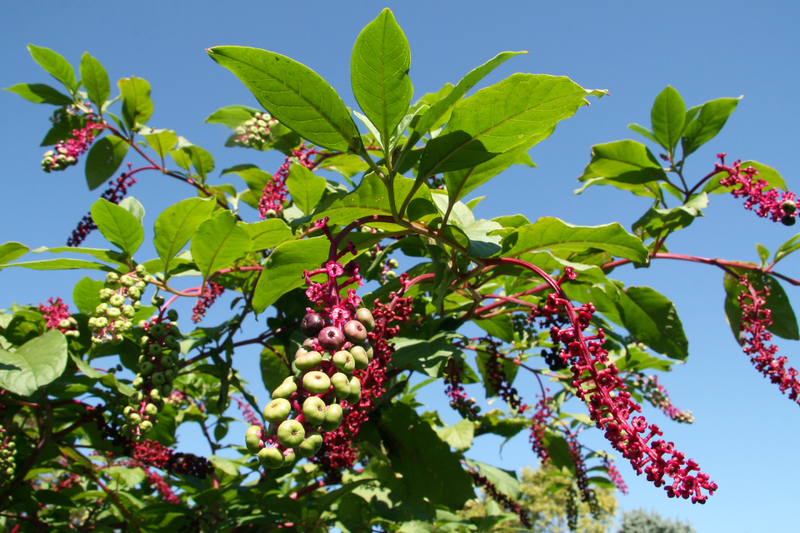 Common names: Pokeroot, Pokeweed, Score, Garget, Coakum, Cocum, Pigeonberry, Red plant, Virginian poke, Gargetweed, Scokeweed, Mechoacan, Cancer root, Jalap cancer-root, Red nightshade, American nightshade, Redweed, and Scoke jalap, Ink berry. Plant description: Pokeroot (P. decandra) is an erect, branched, glabrous herbaceous perennial with coarse,succulent, purplish stems attaining a height of between 100 and 300 cm at maturity. The leaves are borne on short petioles, alternate,ovate, margins entire, growing up to 13 cm long. The small white flowers on borne on short flower stalks along separate branches at the growing tip of the plant and in the axils of the leaves, giving way to dark purple, flattened, spherical berry, containing a red coloured juice and about 10 seeds each. Habitat, ecology and distribution: The various species of Phytolacca genus have a world-wide distribution. Pokeroot (P. decandra) is native to North America and occurs in many areas except the drier regions of the midwest, but in abundance in the southeastern areas of the United States as weed, found in fields and clearings, and along roadsides, often preferring moist areas. Pokeroot is also popular as an ornamental and is often cultivated, especially in Europe. History: The genus name Phytolacca is derived from the Greek phyton, ‘plant,’ and the Latin lacca, meaning lacquer, from ‘lac,’ a reddish resinous pigment obtained from the insect Laccifer lacca, in reference to the crimson colored juice of the berries. Pokeroot has a long history of use by First Nations groups, used in the treatment of rheumatic complaints and skin conditions, and used as a purgative and emetic. Pokeroot has a long and important usage in herbal medicine as a cancer remedy. Pokeroot has a history of usage as a food plant, picked young and eaten like asparagus, or the leaves boiled and then prepared as a salad. Constituents: Pokeroot contains a variety of interesting constituents, including betalain type alkaloids (i.e. betanidine, betanine, isobetanine, isobetanidine, isoprebetanine, phytolaccine, prenetanine), triterpene saponins (phytolaccosides A-1, D2, O and associated aglycones), and at last five mitogenic-acting cysteine-rich glycoprotein lectins also known as pokeweed mitogens (PWM), numbered Pa1 through Pa5.Other constituents include genins (esculentic acid, jaligonic acid and phytolaccagenic acid), as well as histamine (0.13% to 0.16%),GABA, isomamericanin A, PAP (pokeweed antivral protein), spinasterol, sterols, starch, saccharose, and potassium salts (Duke 2003; Mills and Bone 2000, 516; Newall et al 1996, 215; EMEA 1999). Medical Research: Pharmacological effects have been observed in both in vitro and in vivo experimental animal models for Phytolacca americana root extracts and isolated constituents. Many of these effects are attributed to the triterpene saponins (EMEA 1999). • Antiviral: Pokeweed antiviral protein (PAP) is a glycosidase that has been shown to inactivate ribosomes in both eukaryotic and prokaryotic cells, has potent antiviral activity against many plant and animal viruses, including HIV, in vitro, and by injection, in vivo (Mills and Bone 2000, 516; EMEA 1999). • Immunological: Phytolacca mitogens have demonstrated a stimulating effect on immune function, enhancing hemagglutination, leucagglutination and mitogenicity (proliferation of T and B lymphocytes) (Mills and Bone 2000, 516; EMEA 1999).Mills and Bone report that children that have consumed the berries have demonstrated an increase in peripheral blood plasma cells, attributed to poke root mitogen (Mills and Bone 2000, 516). • Antiinflammatory: In vivo studies have demonstrated an antiinflammatory activity for the water insoluble triterpene saponin fractions of Phytolacca in carrageenan-induced acute edema in rats and in mice (Mills and Bone 2000, 516; Newall et al 1996, 215; EMEA 1999). Toxicity: The acute intraperitoneal toxicity of Phytolacca saponin is stated to have an LD50 value in the mouse and of 208 mg/kg in rats (EMEA 1999). The LD50 for isolated pokeweed antiviral protein is stated as 1.2 mg/kg for female mice, 2 days after intraperitonea application. Case reports of human toxicity have been reported with the consumption of Pokeroot as a food and medicinal remedy. Although fatalities have occurred, they are rare (EMEA 1999). The toxicity of Pokeroot is cumulative and insidious, beginning with gastrointestinal symptoms of a burning sensation in the mouth and throat, nausea, vomiting, and diarrhea, followed by prostration, hypotension, dizziness, tachycardia, and unconsciousness, secondary to increased vagal tone (Mills and Bone 2000, 517). Irritation and inflammation have been reported with topical exposure (Mills and Bone 2000, 517). Poisoned patients demonstrate an unspecific increase of immunoglobulins and eosinophil granulocytes, with phagocytosis of thrombocytes (EMEA 1999). Although preferred among many herbalists, fresh plant preparations are considerably more toxic than dry plant preparations (Mills and Bone 2000, 517). Medicinal uses: Pokeroot is among the most powerful and active lymphatic remedies in the material medica, acting chiefly on the skin, mucus membranes and glandular structures. Taken in large doses Pokeroot slows cardiac contraction, reduces the force of the pulse, and decreases respiratory activity, and acts to paralyze the central nervous system. Such doses produces will almost always produce a profound emetic or cathartic activity, although this may only occur after a few days of ingestion – any gastrointestinal irritation is an immediate indication of toxicity, and usage of the herb should be stopped immediately. Pokeroot is best used in small to moderate doses, usually in formulation, and is particularly suited to any kind of lymphatic stasis or indication of autotoxicity. It has important applications in rheumatic complaints, and is of great importance in chronic skin problems such as eczema and psoriasis, as well as lingering infections. Pokeroot also has comes with high recommendations in both acute and chronic afflictions of the uppe respiratory tract, in tracheitis, laryngitis, tonsillitis, pharyngitis and chronic catarrh, particularly when associated with lymphadenopathy. Similarly, Pokeroot was considered a specific in mumps, orchitis, and ovaritis, as well as in breast tenderness associated with premenstrual syndrome. Felter and Lloyd state that “…no other remedy equals phytolacca in acute mastitis,” and if applied in the early stages “…prevents suppuration” (1893). For this purpose, Pokeroot is applied both topically and internally. Pokeroot is commonly used in uterine fibroids, taken internally as part of a formulation, and applied topically as the fresh root infused in castor oil, and covered with plastic wrap to hold it in place overnight. Similarly, a Pokeroot cream or infused oil is used in breast lumps. In the treatment of cancer, Pokeroot is used extensively in herbal medicine. Eli Jones suggested that Pokeroot is particularly indicated in breast cancer, “…when the breast is hard and painful and of a purple hue,” given in doses of five drops of the fresh root tincture once every three hours. Jones also mentions Pokeroot in the treatment of throat and uterine cancer.Jones utilized Pokeroot in his Compound Syrup of Phytolacca in breast cancer and other cancers, indicated especially in older patients, comprised of 2 parts Phytolacca tincture and 1 part each Gentiana and Taraxacum, to which is added equal parts simple syrup. The dose is one teaspoon (5 mL) after each meal. Jones also utilized Pokeroot in his Cancer Drops (containing equal parts with Thuja and Baptisia), and in his Compound Syrup Scrophularia, comprised of Scrophularia leaves (32 parts), Juniperus berries (13 parts), Phytolacca root (8 parts), Rumex crispus root (8 parts), Celastrus scandens bark and root (4 parts), Podophyllum root (4 parts), Corydalis formosa root (2 parts), Guaiacum wood (2 parts) and Zanthoxylum berries (1 part). These ingredients are mixed together and tinctured, to which is added equal parts syrup. Pokeroot is also an important ingredient in the Hoxsey formula. • Fresh Plant Tincture: fresh green root, 1:2, 95% alcohol, 3-10 gtt • Dry Plant Tincture: recently dried root, 1:5, 50% alcohol, 3-15 gtt.